So I just finished typing THE END on my fourth novel, and I’ll be honest with you, it feels a bit weird. I was beginning to think I’d never get here! My amazing spreadsheet, that calculates my likely completion date (based on how many words I’ve written since the start of the project), reckoned I’d be done by September – October at the latest. But that was assuming the novel would come in at 80,000 words – average novel length, and more or less what all three of my previous works of fiction weighed in at. However, as I reached that epic word count the story was nowhere near done. It was the writing equivalent of running a marathon only to have someone tell you after twenty six gruelling miles that the finish line has been moved. I had to keep going. Never mind. At least the majority of the book had been written. And the last time I ‘wrote a novel’… and the time before that… there was something about having the end in sight that propelled me forwards. A sudden sprint to the finish line. But this time, the closer I got to the end of the story the slower I got. Part of that was because I wasn’t entirely sure how the story should end. In fact, if it hadn’t of been for my chums in my writing group I might still be searching for that elusive ending. Even when I had the ending, those last couple of chapters were extremely troublesome. This morning I spent almost 5 hours writing approximately two hundred words. That’s 40 words an hour. Less than a word a minute. Starting next week I’m editing: I already have a pile of ‘go back and fix this’ notes. Then I’ll print the whole thing off, and do ‘the big read through’. When I’m done with drowning my sorrows (because traditionally at this point most authors think they’ve written a massive pile of horse poo), I’ll take my big red pen and start slashing and hacking. I’ll be honest with you, the last two times I quite enjoyed this part – this is the moment when it actually starts to feel like I’ve written a book, something I can be proud of. But I suspect books might be a little like children; you might have had something to do with their creation, you might have created others, but it’s a mistake to let your guard down. When I’m finally done slashing and hacking I’ll give the book to the half dozen trusted folk who have been waiting patiently to read it. My ‘first readers’. And when I’m done working through their comments (which could easily range from ‘not sure she should be wearing a yellow dress in this scene’ to ‘this ending doesn’t make any kind of sense’) well… then I’ll send it to my agent. And that’s when – ‘scuse the language – sh*t gets real. In my experience, feedback from Agents tends to fall into two broad categories: Either they like your book, but have two or three suggested changes (those changes being ‘the beginning’, ‘the middle’, and ‘the end’), or… they don’t like your book, and would rather you’d written something else. But that’s a long way off. Months away. For now I’m just going to celebrate the end of this stage, and feel proud that I got to this point. Again. My fourth novel. My eighth book. That in itself, isn’t bad going. So, check back again soon to see how the editing’s going. In the meantime, if you’re a writer, feel free to share your experiences of getting to the end of a first draft. And if you’re not a writer, but have always fancied writing a book, feel free to ask me a question or share your novel writing attempts in the comments. Now then, where did I put my red pen? Struggling for Christmas Present ideas? 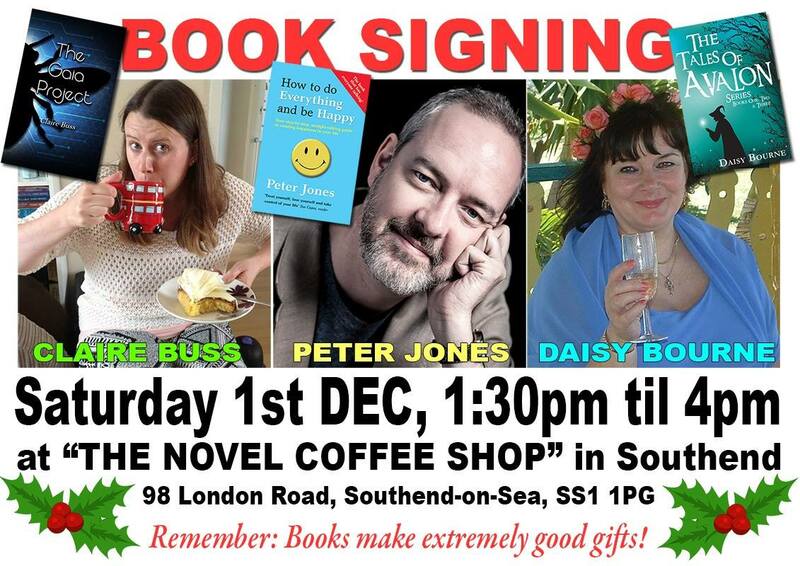 Then why not solve all your Christmas Present Conundrums in one hit by visiting The Novel Coffee Shop (98 London Road, Southend-on-Sea, SS1 1PG), on Saturday 1st December 2018 between 1:30pm and 4pm, where I’ll be signing copies of all my books, along with Sci-Fi author Claire Buss, and Children’s Fantasy author Daisy Bourne. Click the flyer below to see a bigger version! If you follow me on facebook, twitter, even instagram, you might have seen the occasional picture of me, grinning like a maniac, in front of an audience of similarly manic, arm-waving, happy folk (although usually there’s one lone woman, sitting there , arms folded, steadfastly refusing to take part – bless her). I take these photos perhaps once or twice a week – whenever I’m asked to entertain a Women’s Institute, or a U3A, or a Townswomen Guild, or some similar group, with tales of my writing adventures. People sometimes ask me how I got into the public speaking lark. I blame my Dad. Years ago, my father used to run a U3A ‘discussion group’. Each month the group would invite someone along to speak on whatever topic they liked, and then afterwards a discussion would ensue. That was the idea anyway. My Dad loves a good discussion. In reality someone would put the kettle on, a packet of biscuits would be emptied onto a plate, and twenty minutes later my Dad would be washing cups and stacking chairs in the corner, wondering why no-one had actually ‘discussed’ anything. Dad used to try and plan his group’s programme a good year in advance, presumably in the hopes of attracting a few new members with his trove of twelve tantalising topics. But a year is a long time. Stuff happens. And every now and then a speaker would cancel on dear old Dad, and he’d be forced to do some frantic phoning around in order to find a replacement. Which is how I got my first gig. Out of sheer desperation Dad called me and asked if I could step in and do a talk. He’d even decided what my topic would be! Could I speak for thirty or so minutes of “how banks make their money” – thanks very much – see you Thursday – don’t be late. Now fortunately for me, I had at this point been in credit card banking for about twenty five years, the last ten of which was as a freelance consultant. I could have spoken for several days on how my clients separated the man on the street from his hard earned wedge. But I concentrated my talk on some of the sneakier, lesser known, less ethical tricks, that go on in the banking community. My talk was a huge success: There was almost a riot when I announced that “in a few months” the banks would be announcing the ‘end of cheques’. “How will I pay the milkman! ?” exclaimed one woman – at which point, for the first time ever, a proper discussion ensued. Dad was pleased as punch. From that moment on I became my Dad’s ‘reserve man’. Each year, for about three years, I’d get a phone call whenever a speaker cancelled and would always be told what my topic would be. For instance, I did a talk entitled “How will I pay the milkman?” – forty five minutes about, amongst other things, how the banks really wanted to get rid of cheques, but at the last moment had changed their collective minds. I promise you it was more interesting than it sounds. “What do you want to talk on?” asked Dad. “How to do everything, and be happy,” I replied. Several years on and I’ve given that same talk – or a version of it – about two hundred times. Every now and then a book comes along which, when you’ve finished reading it, you’re pretty sure is not only the best book you’ve ever read, but is likely to remain that way for the rest of your life. That’s how I felt when I read THE TIME TRAVELLERS WIFE by Audrey Niffenegger; I couldn’t see how anything could possibly beat it. A friend bought me JONATHAN STRANGE AND MR NORREL, and by the time I finished it, it had squeezed itself into the number one slot. I couldn’t look at THE TIME TRAVELLERS WIFE on my bookcase without feeling terribly guilty. I held JS&MN aloft for many years, creating a shrine for it surrounded by candles in a dedicated room in my basement. No small feat considering that I live in a first floor flat. Then one day I discovered Miss Niffenegger had written another novel. And a few weeks later I became convinced that nothing, NOTHING, could ever be better than HER FEARFUL SYMMETRY. Audrey once again occupied my top slot. How could I have ever doubted her. A couple of months back I finished THE FIRST FIFTEEN LIVES OF HARRY AUGUST by Claire North. For the second time. And Oh My God! Chapter one is your standard ‘something very strange is happening – how on earth did we get to this point! ?’ malarkey. Chapter two (which is when the story really starts) begins with Harry August describing his illegitimate birth – and death of his mother – in a public toilet, on a railway station platform, in the dead of night, in 1919. I’m not going to lie to you. This second chapter is hard going. I could have easily put the book down at this point. I’m so glad I didn’t. Then in chapter three Harry grows up, Harry gets old, Harry dies. And then Harry gets reborn. In a public toilet, on a railway station platform, in the dead of night, in 1919. And so begins the story of a man who soon discovers he is a kalachakra; a person destined to live the same life over and over and over again, but able to retain the knowledge of their previous lives. Just like THE TIME TRAVELLERS WIFE much of the book explores what it might be like to live with such an extraordinary gift. Is it even a gift!? Is it… a curse? How would you cope knowing that for you there is no heaven, no hell… no end?! That you’re essentially immortal, but only within the same 70 years of human history. Like 25,567 Ground Hog days laid out end to end. And what if – after your third or fourth life – you suddenly discover you’re not the only one? This is one of those rare books where I got to the end, and immediately started reading again – right from the start. I’m glad I did too; some of the plot was easier to understand the second time through. Much like life, one imagines. And when I finished the book, that second time, I was bereft. Because I knew – in my heart of hearts – that no other book will ever be as good, and that I will never again have any need to go into my basement. Got a book suggestion for me – why not pop it in the comments below. If you’re reading this in an email, click here. The definitive guide to twenty-first century dating – whatever your age! Here’s a funny little story that I don’t get to tell very often. A while back I got invited to talk to a Women’s Institute in North Essex. This was a return visit, and so I started (as I always do) by asking if anyone remembered how long it had been since my first visit. “16 months!” said a lady in the front row. When I’d finished speaking, the lady in the first row got up to give ‘the vote of thanks’ (I always pity the person who’s been given that job). However, rather than the usual comments (‘what an interesting talk’ or ‘judging by the laughter I think I can safely say everyone enjoyed that’ or ‘where do you get your energy from?’), this lady proceeded to tell me, and her fellow WI ladies, how sixteen months earlier she’d rather coyly bought a copy of How To Stop Waiting And Start Dating, having asked me whether it would be suitable for ‘a lady of her age’. She took the book home, read it cover to cover, followed each and every step (including the advice on buying a pay as you go mobile phone), and four months later – much to the amazement of her daughter and friends – finally met George. And they’d just celebrated a year together. The happiest year of her life. And that’s how she knew it was sixteen months. Her story is similar to many that I sometimes hear, as I travel around Essex. Stories from people who, for one reason or another, had given up on dating websites, or thought they were too old, or met one too many Lotharios… but with a little help from yours truly, found love again. So why a second edition? Shortly after the first edition came out, the world of dating changed. With the ever increasing popularity of phone apps, Tinder suddenly crashed into our world. Finding the man or woman of your dreams became as simple as swiping right (or left) on a bunch of selfies. People who Tinder thought you might like to spend the rest of your life with. If ever there was an app designed to put you off dating for life, Tinder is it. That’s like a red rag to bull! Why doesn’t Tinder work? Could it? Was there a way of using it that everyone else seemed to have missed? I needed to know. Now unfortunately it took a little while longer than I anticipated to research test, and write my conclusions, but four years on the entire book has been updated. And not just for Tinder either. Every single piece of advice I put my name to back in 2014 has been scrutinised, and where appropriate, given a fresh new lick of paint. and is Bumble any better. Flash Bang Wallop What a Picture! and why you should stop doing ‘duck face’! and what to do when they reply! A smarter, easier, stress-free way to meet someone for the first time! What Type of Pizza Are You? – break them at your peril! If you’ve ever found dating a challenge, if you’ve found dating apps or websites to be less than fulfilling, if the thought of a ‘first date’ terrifies you, I promise this book will guide you through the potential pit falls, help you avoid the liars and Lotharios, and show you how meet and date people you actually like. And as if that wasn’t enough, the mini-companion-guide to How To Stop Waiting And Start Dating has also been given a makeover. Whilst the actual content hasn’t changed all that much, From Invisible To Irresistible has a new title. One that makes much more sense. One that actually tells you what the book is about! If the thought of dating apps or websites or any of that techno-malarkey makes you feel slightly nauseous – and you’d rather meet someone ‘the old fashioned’ way – How To Be Even More Attractive could be exactly what you’re looking for. Both new editions are available right now, in paperback, and for your kindle enabled phone or tablet. What’s more, whether you want a paperback or an ebook, you’ll pay less than you did for the first edition. How To Be Even More Attractive is just 99p! Other ebook editions for other ebook reading apps and devices should be available early 2019. If you have any dating relating stories that you’d like to share with me, I’d love to hear them. Feel free to pop them in the comments below (or click/tap here if you’re reading this in an email). And if you are reading this in an email, why not forward it on to a friend who might find it interesting? So, here’s the thing. I’ve been working on a new novel. novelists are supposed to do. Here’s how my writing regime currently looks. I average 2 writing days, per week. I average 5 hours per writing day. And I average, 200 words per hour. Now, I used to post these kind of writing stats on facebook, along with my expected completion date and a funny or curious picture relating to the scene I’d been working on but then I stopped. Because those writing stats aren’t really very good. Two days a week!? Only 200 words per hour? That’s pathetic! Most of my writing chums could equal what I turn out once a week, in one sitting. Although that’s not the real reason I stopped. Because I’m afraid of completing this novel. Right now, I think this book is probably the best thing I’ve ever written, by far. It’s quite a deviation from stuff I’ve written before; for one thing it features a female protagonist. Who’s 18. And I am, in case you hadn’t noticed I’m a man. It’s also darker, less comedic, and based on a true story. It’s set in 1983 and at the moment, there’s no clear happy-ever-after… blimey. So if I finish this thing, and no one likes it well that’s a LOT of time I’ve just wasted! Fortunately however I have YOU! How d’you fancy being part of my personal cheer leading squad? It’s quite a simple job. All I need is for you to ask me, every now and then, how the book’s coming along. Ask m how many words I’ve managed to churn out recently. Ask me if I’ve started editing yet. Ask me if the book will be finished by Christmas. You can also help inspire me. If you were around in 1983, what memories do you have of back then? What clothes did you wear? What music did you listen to? Did you have big hair? All this stuff is useful to know. Leaving a comment below, or on facebook, or even on twitter. In the meantime I best get back to writing. Last week (ish) I was invited back to Phoenix FM to talk to Michelle Ward about my latest novel ‘My Girlfriend’s Perfect Ex-Boyfriend’. Now I know you’re probably all sick to death of me plugging the latest book (this’ll be the last one for a while – promise!) but the interview was such fun to do that I couldn’t not share it with you. I’ve done a fair few radio interviews over the past few years (you can find them all here or on youtube), but of all the radio shows I’ve been on, Michelle’s interviews are my favourite. Yes, she takes the mickey out of me on air, and yes, she keeps me on my toes with her completely random comments or questions, but it’s all part of the fun. This interview was quite long (about twenty minutes), with breaks for commercials and traffic and all that jazz, so I’ve broken it into two parts, and Michelle’s rather cleverly edited out all the ads for double glazing. In this first part, Michelle asked me how I became an author in the first place, which somehow ended up in a discussion about how to meet the man or woman of your dreams on facebook. See what I mean? You wouldn’t get that on the Radio 2. If you can’t see a big PLAY button in an image below, click here. In the second part we finally got around to discussing My Girlfriend’s Perfect Ex-Boyfriend. I told her how the story came about, why the cover was such a pain to get right, and who would play the three main characters should the book ever get made into a movie. Again, if you can’t see a big PLAY button, click or tap here. that the price of my third and arguably best novel will be going back up very, very soon. To avoid missing out on getting a fantastic laugh-out-loud read that costs less than a cup of coffee, click or tap here to visit amazon – or type BuyTheBook.TODAY into your web browser.